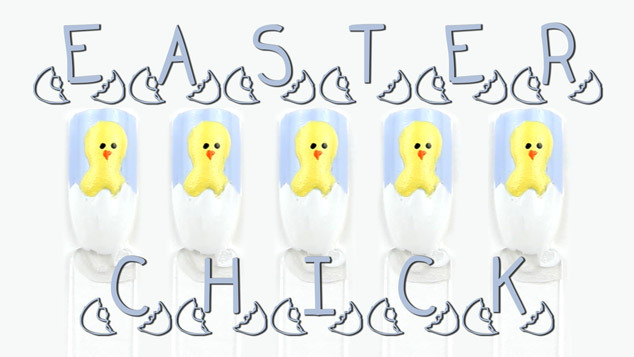 Easter is nearly here and I have a few nice Easter nail tutorials lined up but today I am focusing on a really easy to do chick nail art. I often get comments from people saying they could never do my nail art so this one is very simple and aimed at either beginners or as a nail idea you can do if you don’t have a lot of time. You can see my other nail art videos here. You can vary colours and polishes but I really recommend the Sally Hansen Sugar Coat – Sweetie 400 polish for the chick texture. I have 4 different Sugar coat polishes and I don’t really know why I bought them as I am not a massive fan of textured polish. When I tried the Sweetie I thought that the sugar texture would be perfect for a little chick so that it would make it look a bit fluffy and stand out against the rest of the nail. The polishes are on super cheap on Ebay so I have attached a link if you are interested as they are £4 cheaper than in Boots. If you are wanting to get into nail art I really recommend looking online at the Rio Nail Art Polish. They aren’t too pricy, have a range of colours and the dual tip and brush combination is fantastic for creative nail designs. The polishes I bought have a very strong colour and a good texture so you can draw with them like a pen. I really hope that you like the video and please subscribe! If you want to see any more nail tutorials let me know and if you would like to see more complicated nail art or nail art aimed for beginners like this one.